Avoid travel snafus with some tips from GroundLink, a global car service that operates in every major city and 110 countries. Just in time for your summer or fall vacation planning, GroundLink (http://www.groundlink.com), a global car service that operates in every major city and 110 countries, is offering seven tips to help you avoid travel snafus and make the most of your global travel. And if you’re still deciding where to go, you may want to check out the recently released U.S. News & World Report’s annual ranking of the World's Best Places to Visit. 1. Your Passport: Make several photocopies of your passport and pack one in a carry-on bag, another in your checked luggage and keep yet another one at home with someone you trust. It will help prove your citizenship if your passport gets lost or stolen. You may also want to make an electronic copy that you can store in your e-mail account, just in case. 2. Your Doctor: Ensure you have all of the proper vaccinations and all your prescriptions are current and filled. Carry a list of all prescriptions you are taking, just in case they are lost or stolen. 3. Ground Transportation: Finding ground transportation in a different country can be confusing and costly if you aren’t familiar with the local providers. Selecting a reputable global car service with a proven track record ensures that you’ll be transported in a reliable vehicle, driven by a licensed professional driver, taking the worry out of airport transfers. You can simplify your travels by booking ahead for airport transfers and other planned excursions. Plus, you won’t have to worry about having cash available in the local currency to pay for your rides. 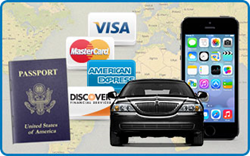 GroundLink is a global car service that operates in every major city in the United States, and in 110 countries. You can book online, through its 24/7 customer call center, or with the GroundLink iPhone or Android app. 4. Credit Cards: Contact your credit card providers in advance of your travels to provide them with the dates of your travel and the countries you are visiting. This will help you avoid the hassle of having your credit card denied because it's being used in a country where you don't normally transact business. Also, check to see if your credit card providers charge foreign transaction fees and ask about setting up a pin number for ATM use. 5. Mobile Phone: Call your mobile phone provider to set up the right international wireless plan for your travels. If the options seem too pricey, consider using Google Voice, Facetime or Skype to stay in touch with friends and family while you're abroad. Also, do a little online research to find out if you will need an adapter for your phone charger in the countries to which you'll be traveling. 6. Travel Insurance: Some countries require that you have out-of-country medical insurance as part of their visa requirements. Regardless, it's a good idea to have a basic travel insurance plan for medical emergencies, medical evacuation, and 24/7 emergency assistance. 7. Smart Traveler: The Smart Traveler Enrollment Program (STEP) is a service for US citizens traveling abroad to register their trips with the nearest U.S. Embassy or Consulate. Certainly something you should consider if you're traveling to a country with a history of political instability. GroundLink is a global car service that leverages a proprietary technology platform to provide seamless, reliable and consistent ground transportation for travelers worldwide in most major cities and 110 countries. GroundLink offers a multiple booking platform for its consumer and corporate clients that includes its website (http://www.groundlink.com), it’s iPhone or Android app, and its 24/7 call center (855.463.7150). GroundLink has offices in North America and Europe, with its headquarters in New York, NY.